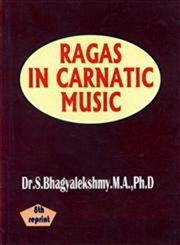 by Dr. S. Bhagyalekshmy, M.A., Ph.D.
More than 450 popular ragas in Carnatic music have been compiled in this volume. Each raga has been explained in detail with its svara notation, Arohana, Avarohana, Melakartha and Janya parentage, Raga Lakshana, and visesha sanchara. Each raga contains details about the compositions available in each raga with the name of the composer and tala. Author(s): Dr. S. Bhagyalekshmy, M.A., Ph.D.